so naturally, I started to get really curious about the book's cover art and why a blurb on the back notes that "The Black Spider was a horror story of its day." Then the "gotcha": as the post-christening festivities commence, a question about a "rough black window post" built into the newly-built home leads the grandfather to tell a story about events that had occurred in the area hundreds of years ago, one passed on through the generations. And oh, what a story it is. A religious order of Teuton knights has returned from Poland and Prussia, having been sent there to "fight the heathen." While there, they got caught up in the lifestyle, and on their return, continued to live, each "according to his own nature and pleasure." 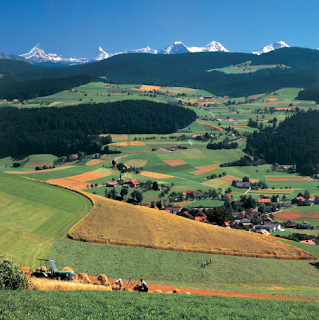 The worst of these was Hans van Stoffeln of Swabia, and he took a lot of pleasure in persecuting the peasants. First, he took them away from their land for two years by ordering a huge castle on a hill. When that was finished, and just as the peasants were rejoicing that they could get back to feeding their starving families and tending their livestock, von Stoffeln makes another demand -- they must now build a shaded walkway. He wants particular trees from a location that is hours away, and he wants everything done within a month or disastrous consequences will follow for the peasants and their families. Thoroughly in despair, because this is an impossible task, the peasant men wonder how they're going to tell their loved ones. At that moment a huntsman, dressed in all in green (hitherto referred to as the "green man" or the "green huntsman" ) appears, and offers them help -- and for payment, all he wants is an unbaptized child. When the women are told what's going on, they believe they can help their men, but it becomes obvious that this is not working out. One of the wives, Christine of Lindau, takes up the green huntsman's offer, thinking that when a new baby is born, the people will find a way to deceive him, and they do manage to stave off the devil for a while. However, they hadn't reckoned on the black spider, a reminder that the huntsman "would not suffer himself to be duped without recompense." d) and last but not least, when children do not "follow their parents in their paths and thoughts," and disregard wisdom passed down through the ages. And what about the spider? Well, I'm not very well versed in Germanic mythologies or Swiss folklore regarding the symbolism of the spider, but I did look up "green huntsman" to see if there was something significant I could use relating to this book and came across this photo of a green huntsman spider. Coincidence? Maybe, but in Christian mythology, the spider is, of course, associated with the Devil, and you've got the Green Huntsman of the story in that role as the source of the spider, so it should be easy to figure out. 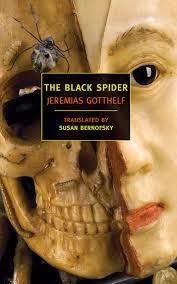 However, according to Terrence Rafferty of the New York Times, the spider also becomes a symbol of plague, and there are scenes in this book that support this idea as well. Even if you're not so inclined toward the Christian messages (as in my case), you can still enjoy The Black Spider. There are a number of scenes that are bound to produce that wonderful frisson of chills crawling up your spine, making it a perfect pre-Halloween read; it's also a peek into a specific society at a specific time and place making it a good story for historical fiction readers. I thought it was pretty good, actually. Obviously it's a bit dated for modern readers, but all in all I liked it. Sadly due to home renovating, it took me a few days to get through it! Hmmm. Not the kind of book I would normally read, but your review has me now intrigued. It's one of those books where you have to keep in mind where it's coming from, but I thought it was still fun. If you look up Gotthelf, you'll discover he was a pastor. Enough said.